It’s a damn good thing TNS is free, no? Lately I’ve been all take-take-take and no give-give-give. And this week is no different; once again I’ve pooped out entirely on a Smackdown, and I can’t blame the tofu any longer. At least I feel slightly guilty this time, which is why I’ve made you this spiced apple cider ice cream. 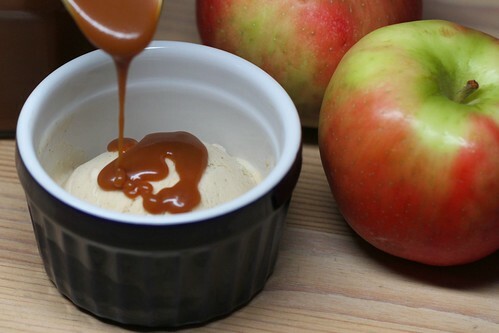 Paired with David Lebovitz ‘s caramel sauce, it’s the ultimate frozen fall treat and a great way to use up all the apple cider you’ll have after making French onion soup. Pour the cider into a wide saucepan set over medium-high heat and bring to a furious simmer; cook until thick and syrupy and reduced to half a cup. Heat one cup of the cream and the milk in a medium saucepan with the sugar, salt and all the spices until hot but not boiling and whisk in the reduced cider. Pour the remaining heavy cream into a large bowl. Whisk half the hot cream mixture into the egg yolks to temper them, then whisk the egg/milk/cream into the rest of the milk in the saucepan. Cook over medium heat until it coats the back of a spoon. Strain the egg/milk/cream mixture into the bowl containing the remaining heavy cream and whisk to combine. Transfer to some tupperware and freeze for at least 3-4 hours before consuming. If I had an ice cream maker, I would weigh twelve bazillion pounds. Oh my god, are you kidding me? This exists? I NEED it. Yeah, that would pretty much kill me. But damn, I’d enjoy it! What your posting may lack in quantity you are certainly making up in quality. The last 2 recipes are keepers and I love the idea of making them together for a fall feast. Totally thought I’d invented cider ice cream – the fact that someone else also came to the conclusion that it’d be a good flavour makes my brain feel highly validated.